Obviously, the easiest way to enjoy the 50-pack is by lowering your expectations. That way a truly terrible film like Twister’s Revenge! will seem almost like a strange, noble failure, a completely forgettable piece of junk like Devil With Seven Faces will become an adequate time-waster, and half-way decent fare like The Creeper (also know as Rituals) will seem like some sort of little masterpiece. Outside the confines of the 50-Pack a horror movie like this might not warrant a second glance; but here, in this context, it’s pretty interesting. 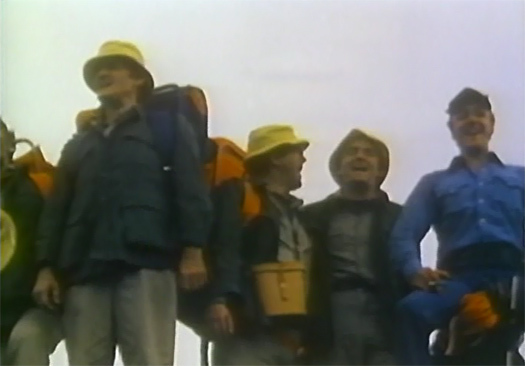 The plot concerns five doctors on a trek in the Cauldron of the Moon, a remote wilderness area where, we’re told, the Indians believed the moon bumped into the earth. “The Cauldron’s in the middle of nowhere,” says the grizzled pilot who drops them off by hydroplane. Undeterred, the doctors arrange with the pilot to be picked up in seven days, hike a couple miles, and set up camp for the night. Around the fire they discuss the possibility of starting a practice together, the merits of organic grafts and the morality of assisted suicide. Their doctor-ly banter gets a bit tiring after a while, but you have to appreciate that the filmmakers were trying to create an authentic rapport between these characters, who are all supposed to be old friends and colleagues. Not only that, but it’s refreshing in a horror movie to see people other than your typical libidinous teenagers. And, as the patient viewer will discover, this talk of morality becomes important later on. In the morning, all the doctors shoes are mysteriously missing, except one pair--those belonging to DJ (Gary Reineke). He decides to go look for help while the others, left with no other choice, stay behind. But that night they discover on the outskirts of their camp a deer’s head impaled on a spike, planted there, it seems, as if part of some strange ritual. Who could’ve done such a thing? The Blair Witch wouldn’t come on the scene for another twenty years, so it’s anybody’s guess. Understandably freaked-out, the four remaining doctors wrap cloth around their bare feet, pack up their bags and set off into the woods, all the while being stalked by someone or--cue the ominous music--something. This is where the movie gets interesting. At one point during their flight, the doctors stop to pose for a photograph--a decision that leaves them sitting ducks for their pursuer. And yet this foolish choice doesn’t feel like part of the trend in horror movies to have characters explore dark basements, undress at inopportune times or do any number of stupid, unnecessary things when they should be concentrating on getting the hell out of there. Here it feels somehow authentic. It’s part of human nature, even in extreme situations like this one, to take our own safety for granted. Who wouldn’t stop to snap a few quick photos of your exhausting, shoeless journey, if only to prove when you get home that it really did happen? That you might not make it home at all wouldn’t seem possible. Still later, there’s a very suspenseful scene in which the men have to cross a roaring river, the bottom of which is, unbeknownst to them, lined with bear traps. And as the film progresses, we come to understand that all the campfire talk of surgery, assisted suicide and morality was a way to show us what lengths each character is willing to go to survive. What you expect to be a low rent Canadian Deliverance when you first pop open your 50-pack and put the DVD in your player proves to be quite an effective little thriller. Now if only we could apply the same 50-pack formula of low-expectations to the rest of life we’d never be disappointed. Anybody else pleasantly surprised by The Creeper? Was it too Canadian or not Canadian enough? Any recommendations for other obscure Deliverance knock-offs? I have this same 50-pack, and my biggest problem with this movie was the presentation: It was way too damn hard to SEE it. The print was the worst I've ever seen, and I have a lot of these Mill Creek packs. Hal Holbrook was the only thing that kept it interesting for me, really. William--I agree. This one really does have the worst presentation of any movie on here. Too bad. 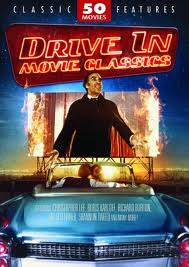 I enjoyed everything else about it--an above average Deliverance knock-off with a low-rent Canadian charm to it. Thanks for stopping by!